Decorating a Christmas tree is an important tradition, it is an activity that tells so much about us. 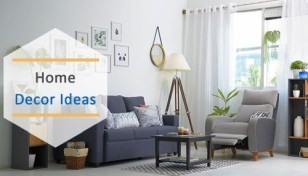 Usually, we decorate with light strips, display family photographs, collectibles or purchase readymade decorations. However, if you have time and some crafting skills, you should try DIY Christmas tree ornaments. These will not only save you money but allow you to add a personal touch to your Christmas tree. Kids and adults can equally participate in making the ornaments that’ll go on the tree and make it stand out in the neighborhood. Read through the guide listing different kinds of Christmas tree ornaments you can make on your own. Pinecones appear everywhere on the ground during the Christmas month, but we don’t bother considering them as decor objects. 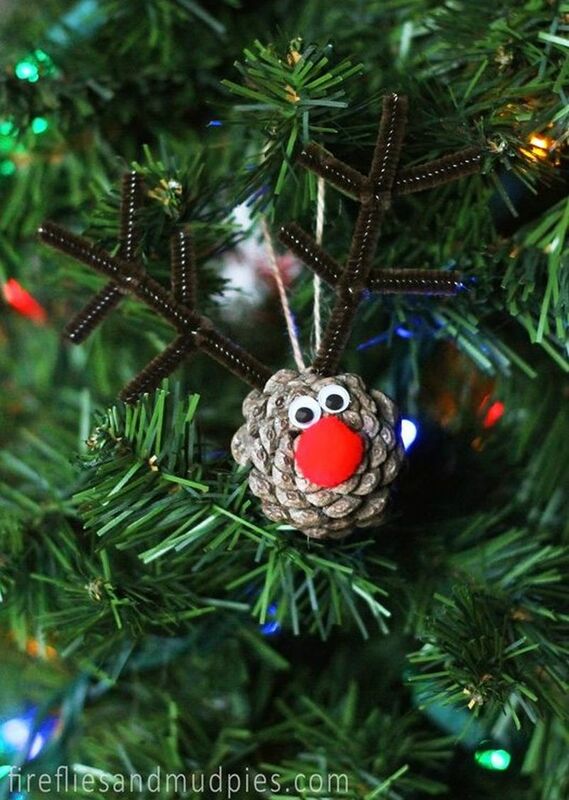 You may be surprised to know that pinecones can be used to create a number of Christmas tree ornaments. Have a look at these cute little owls with different expressions on their faces below. 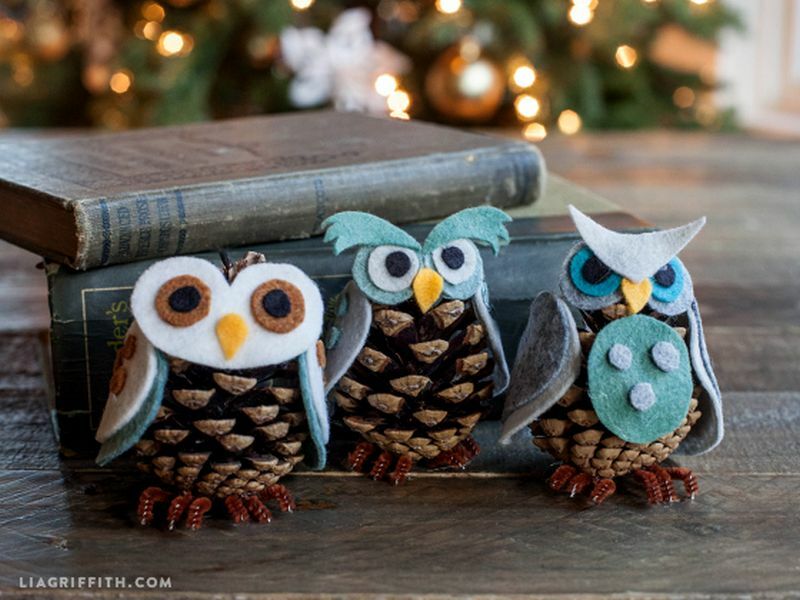 To craft such cute owls you’ll require colored felt, scissors, a hot glue gun and pinecones of course. Crafting them is easy, but if you are not confident, consider the following tutorial. 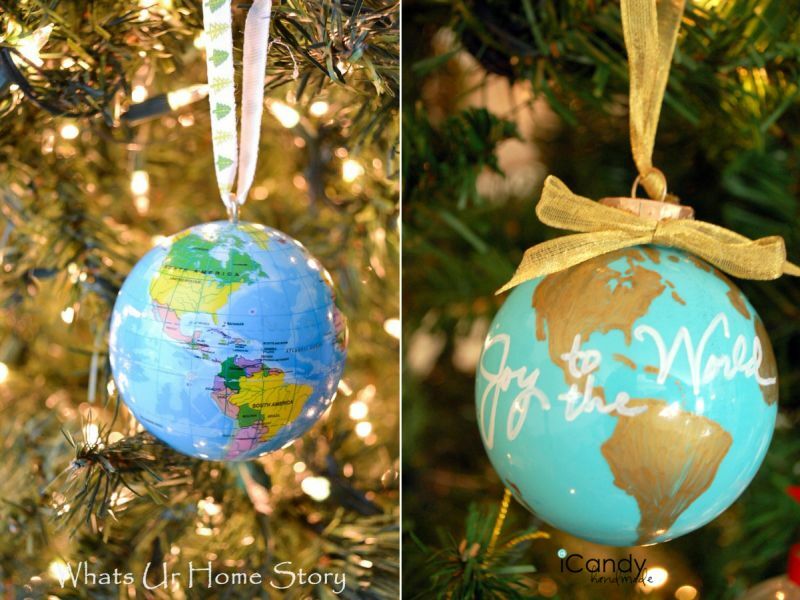 Want to show your passion to travel the world on the Christmas tree? 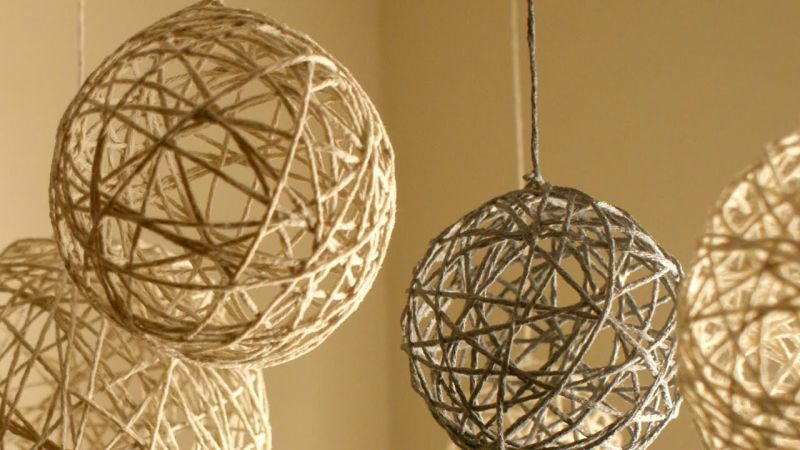 Check out this mini globe ornament, which you can craft in a few simple steps. You will need a Styrofoam ball, map, glue, glitter, ribbon, a wooden skewer, and a scissor for this Christmas craft. Check out the tutorial for help. 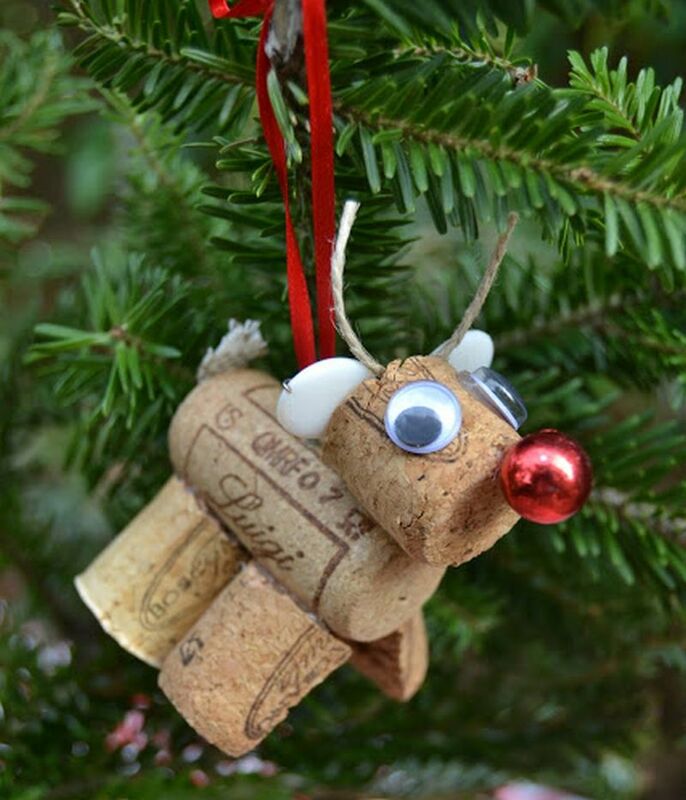 Don’t ever throw wine bottle corks as you can use them to create amazing ornaments for your Christmas tree. 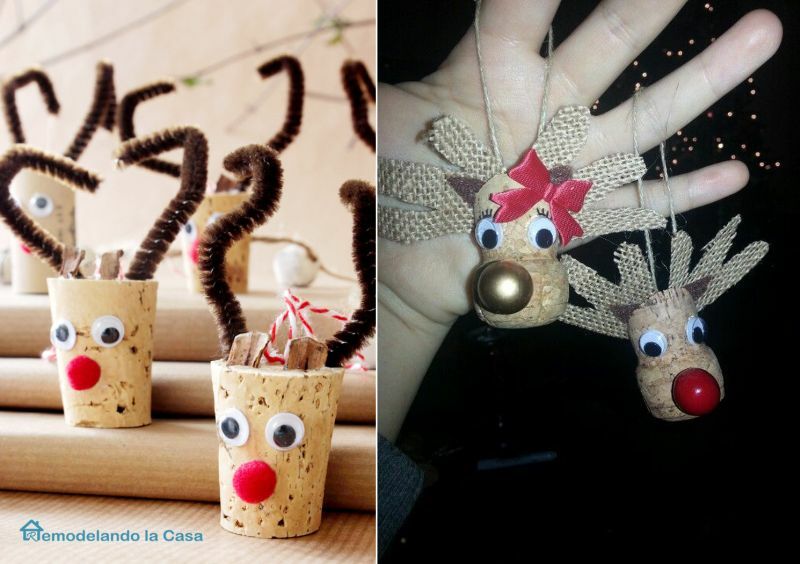 Look at these little reindeer ornaments, which are entirely made using corks and other embellishments. Reindeers are an important element of Christmas, and this DIY project is great to add polar essence to your Christmas tree. 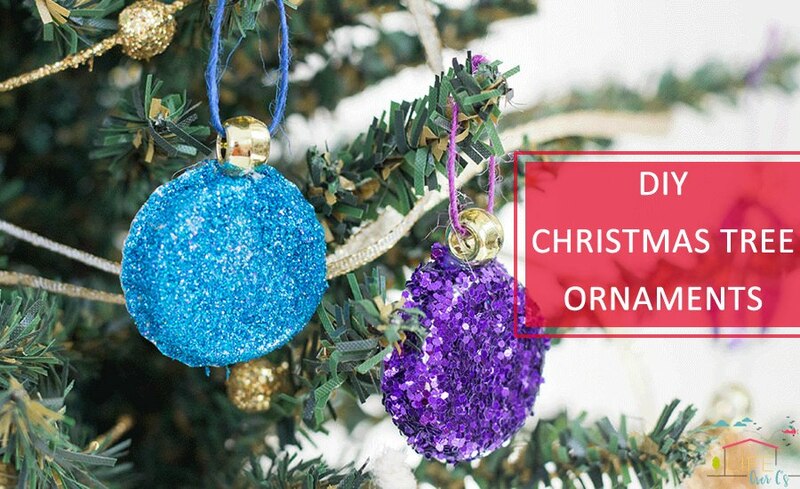 How about decorating your Christmas tree with DIY thread ball ornaments? 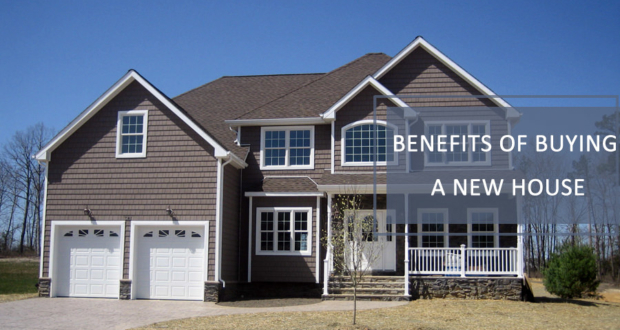 It is a cost-friendly project that just requires colorful threads, balloons, and glue. The interesting thing is you can create them in different sizes and colors and even involve the kids. 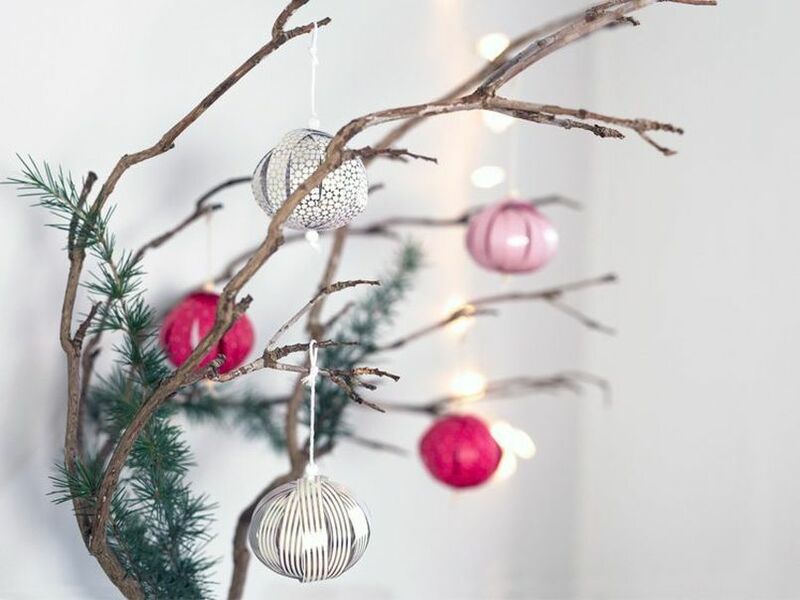 The DIY Christmas thread balls will give your tree a rustic appeal. You will love this mini felt Christmas tree, which you can make on a budget using colorful felt and jingle bells. 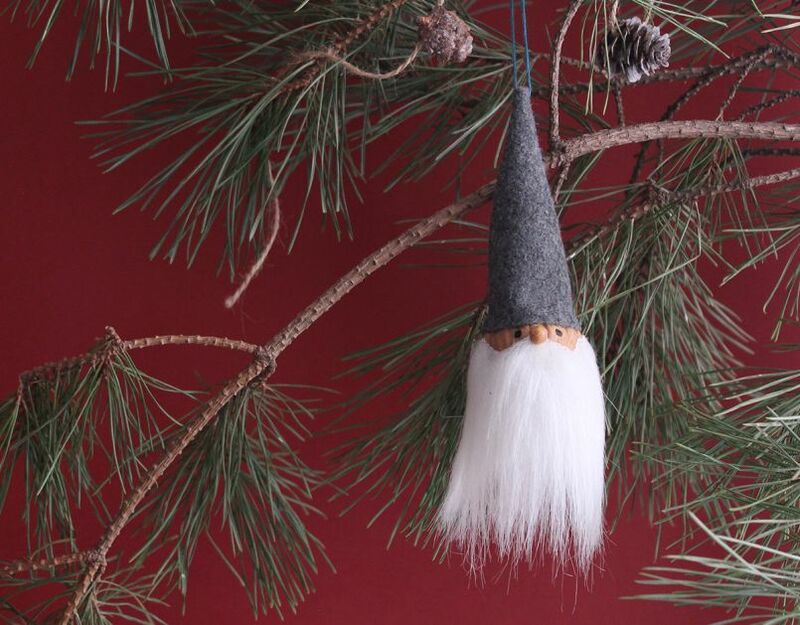 To craft this adorable mini tree ornament, you need to cut out and glue colorful felt pieces in shape of a pine tree, then attach a jingle bell or star on its top. Kids can also be involved if you’re creating a number of pieces to put on your Christmas tree. 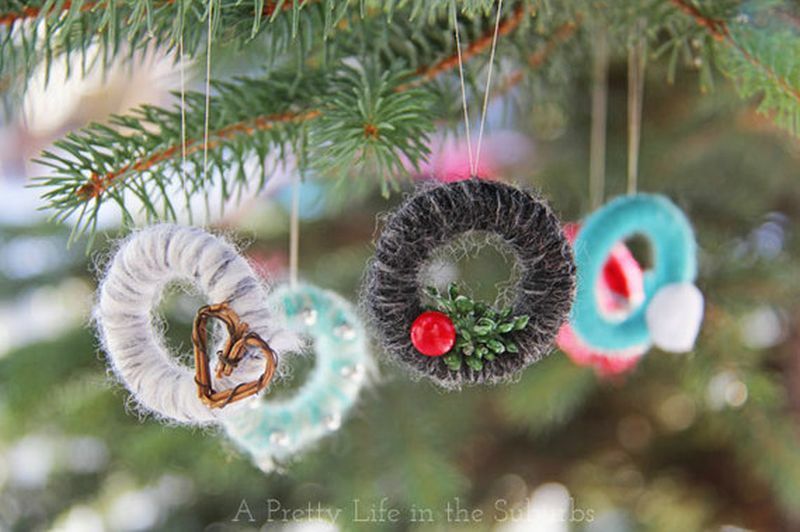 Aren’t these miniature yarn wreaths the cutest DIY Christmas tree decorations? 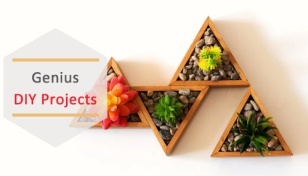 They are perfect to make your Christmas tree undeniably beautiful and unique. 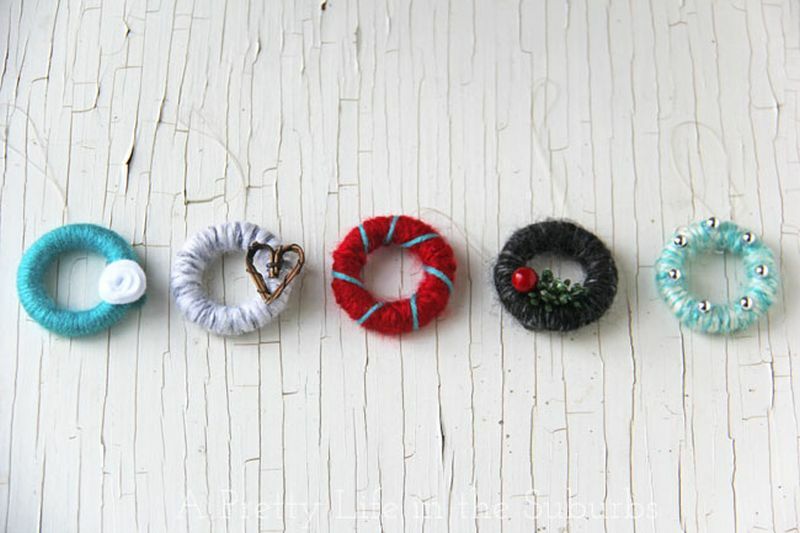 These yarn wrapped wreaths are super easy to craft. All you need is little rubber rings, and desired ornaments. 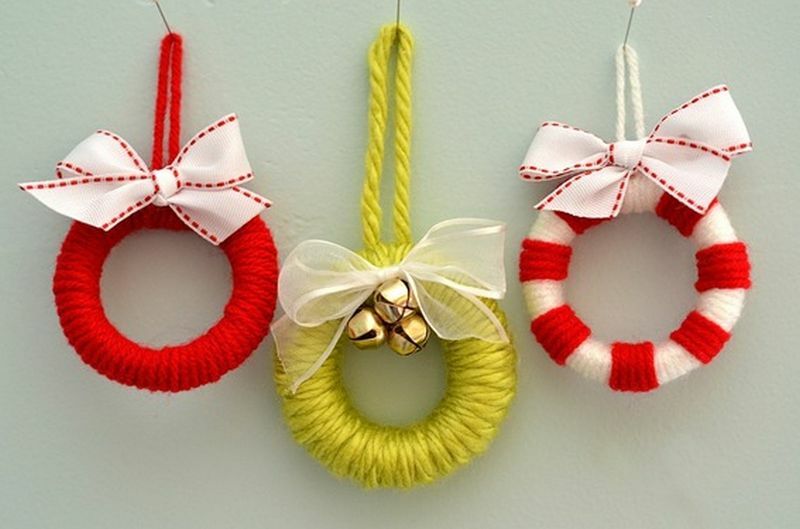 Wrap up the rubber rings with yarn of your favorite color, and then glue some embellishments to give it a festive look. Christmas is all about enjoying snowfall with friends and making a snowman in the yard. There’s a great chance for you to add an equally attractive snowman on your Christmas tree. Make this snowman ornament using foam ball and your DIY skills. 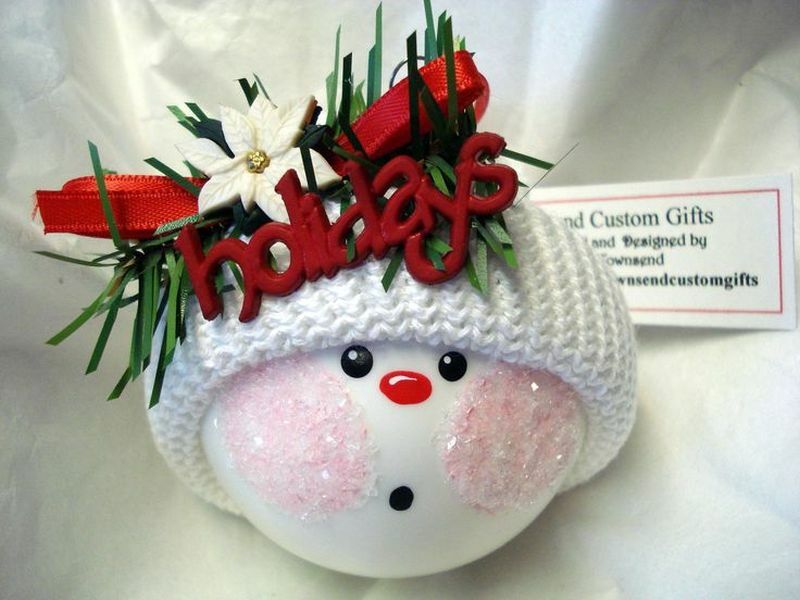 You will require a foam ball, white yarn to knit a cap for the mini snowman, ribbon and a few embellishments to adorn the cap. Just mark the face of the snowman and it is ready. You can ensure fun-filled winter holidays for your kids by engaging them in this easy Christmas project. 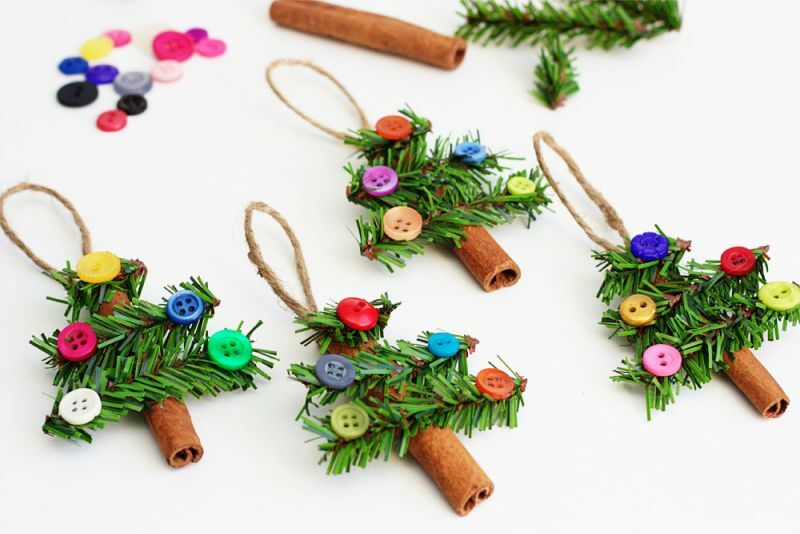 You can teach your kids how to make little pine tree ornaments using cinnamon sticks, colorful buttons, and pine shrubs. These greenish tree ornaments will look wonderful when you will pair them with lighting and other ornaments. Yes, they are not the slickest looking Christmas ornaments around, but they look most endearing with a little personal touch. 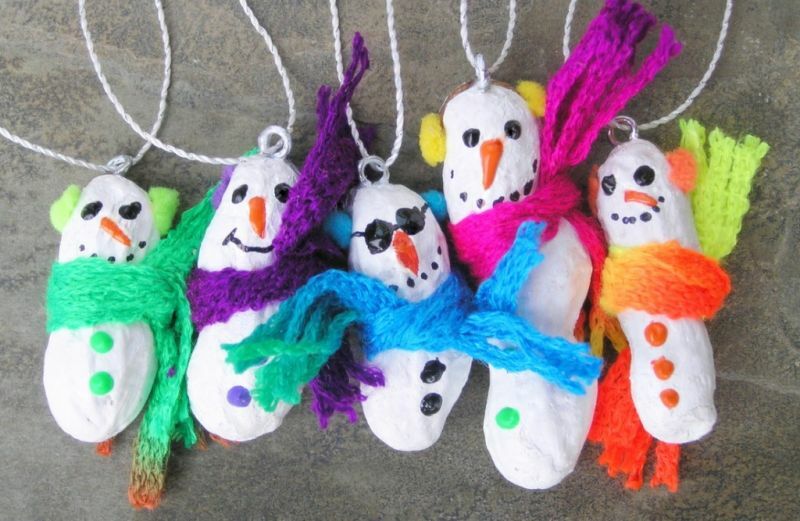 Your little ones and you can enjoy painting peanuts in white color to look like a snowman. 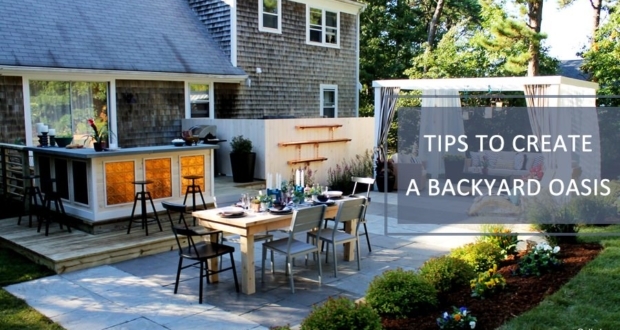 They will certainly look pretty when gazed from behind the tree shrubs. 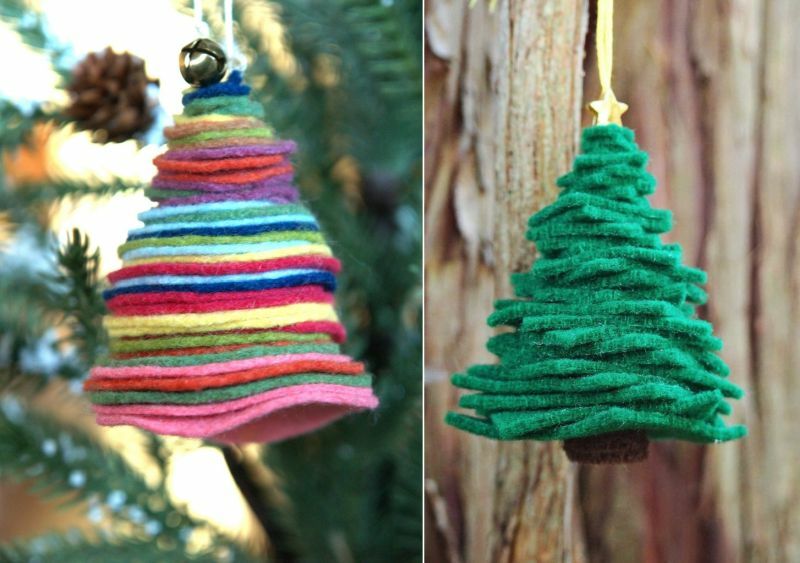 If you have leftover yarn in your cupboard, bring it to good use by crocheting mini trees that will look adorable on a Christmas tree. 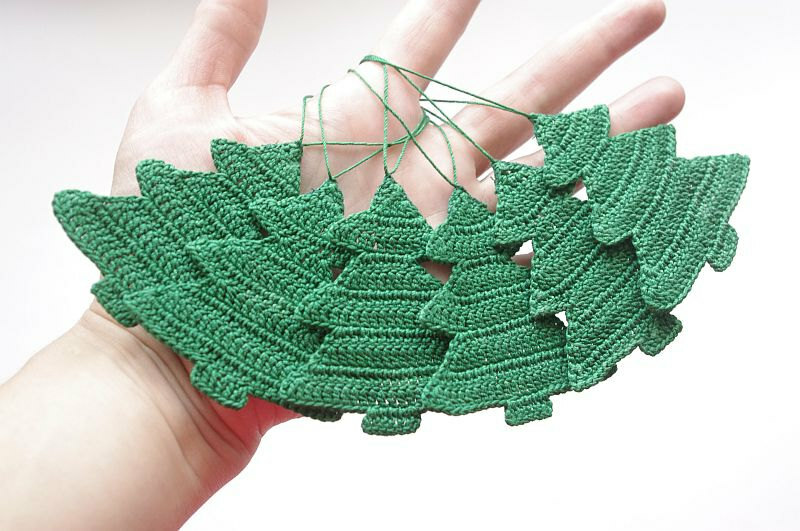 Crocheting mini trees is effortless and will not consume a lot of your time, you can knit them in just 20 -30 minutes provided you have the skills. A Christmas tree will not look perfect until you add some glitter and sparkle to it. 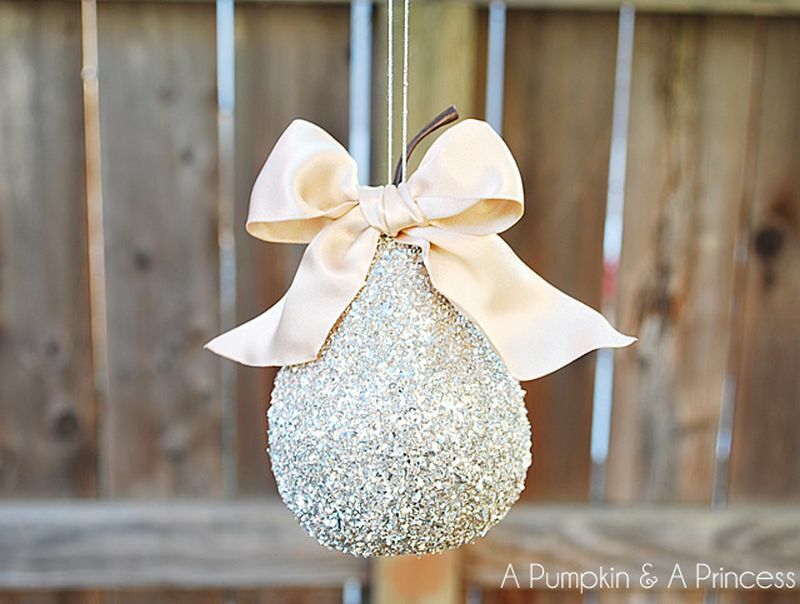 You can paint a pear with glitter and decorate it with a ribbon bow. The pear will instantly make your tree look beautiful. 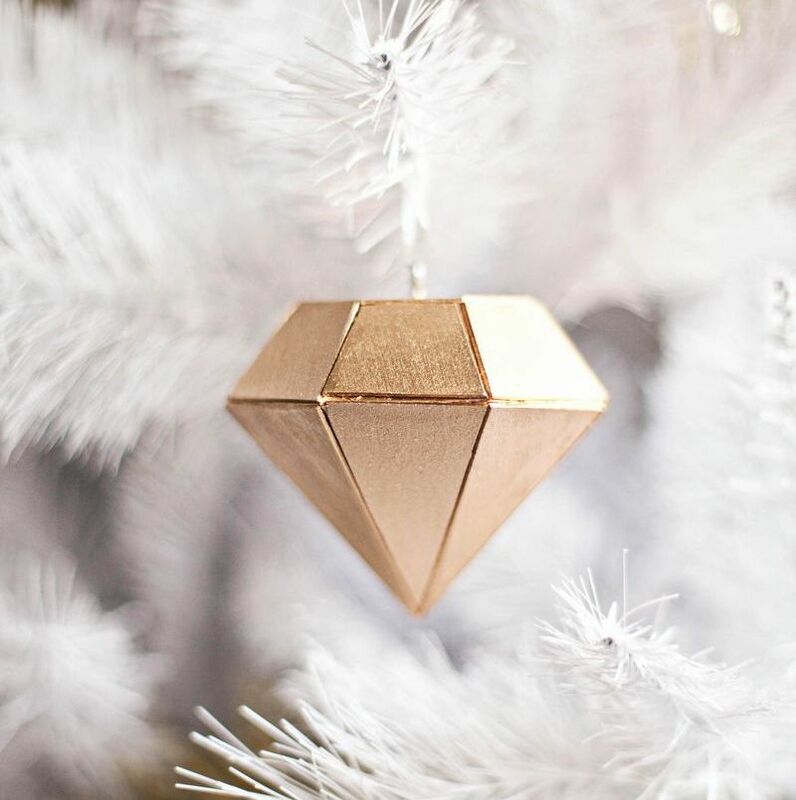 Try making this 3D wood diamond Christmas tree ornament that’s sure to draw attention from everyone. 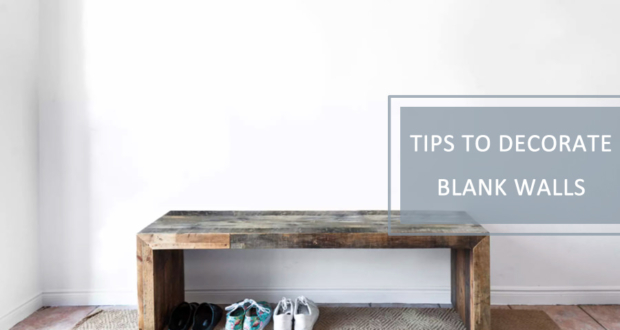 This DIY project will require a lot of patience and above average woodworking skills. 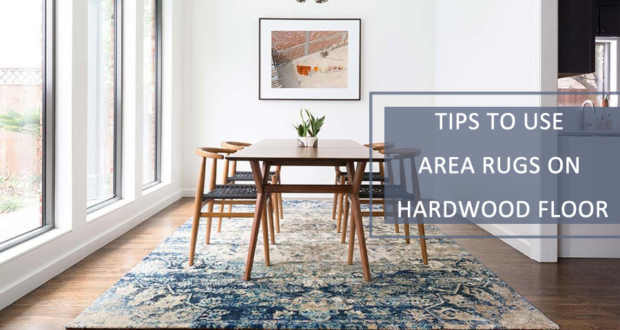 If you want to give it a try, check out the step by step guide for help. 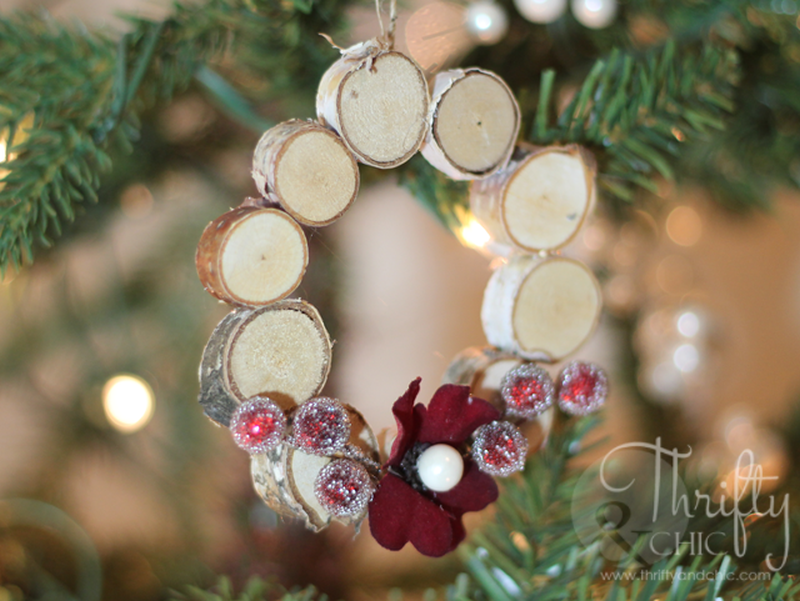 How about decorating your Christmas tree with a mini wood wreath? This lovely wreath is made using slices of a tree branch, glue, and other festive embellishments. It’ll offer that rustic appeal and look adorable on the Christmas tree. We are sure at guessing that using disposable cups on the Christmas tree would be the last thing you’d have thought. However, you’re in for a surprise. 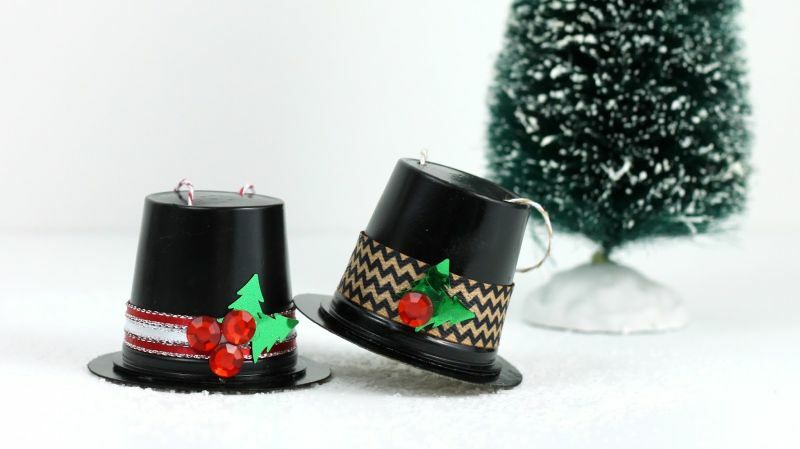 Yes, you can create lovely snowman hats in just 10- 20 minutes using disposable cups, black tape, and Swarovski crystals. Snowman hat ornaments look pretty and adorable on a Christmas tree with a cute little snowman alongside. 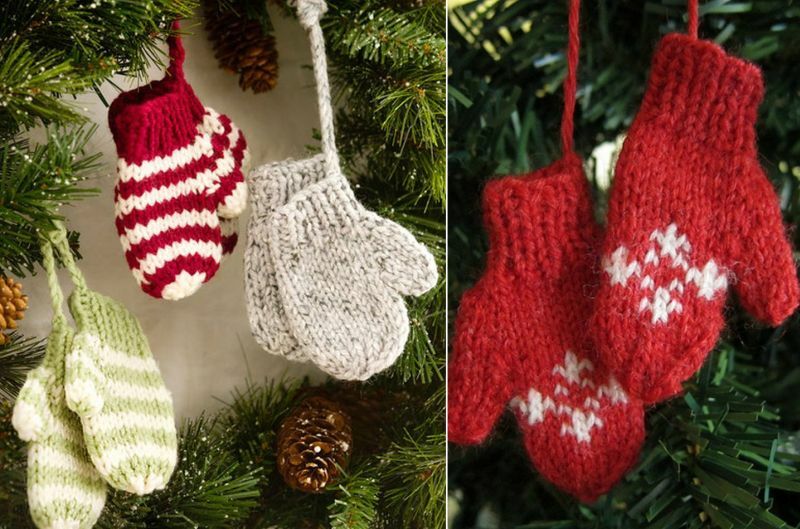 Spruce up your Christmas tree by hanging cute mini gloves on it. 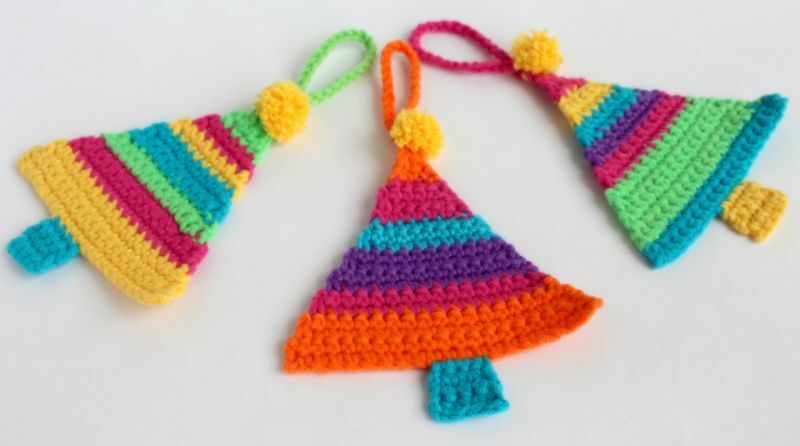 If you are familiar with the art of crocheting, knit a few colorful gloves to hang on your Christmas tree to celebrate chilly winter and snowfall. To add that Christmas appeal, consider crocheting red and white gloves. Creating a matchstick star can be a favorite holiday spare time activity for kids, it will also help them develop their imagination and creativity. 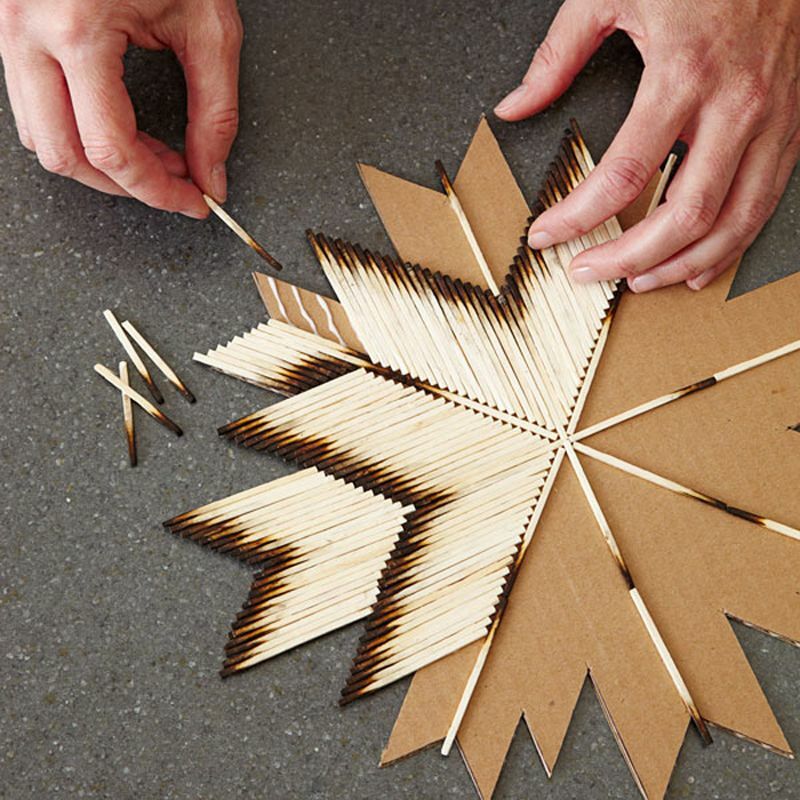 To craft a matchstick star you require a cardboard, scissors, lots of matchsticks, glue and few colorful gems. It’s simple and achievable. Let your Christmas tree sing with this fancy ornament, easily achieved by gluing broken CD pieces onto ribbon-filled decoratives. 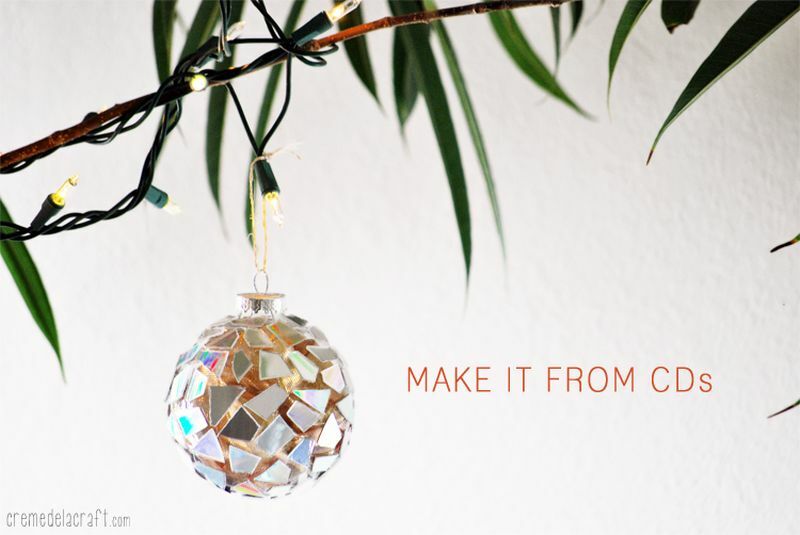 This shiny broken CD ornament will surely make your Christmas tree look better than ever. The CD pieces will reflect light falling on them thus adding charm to your Xmas tree. 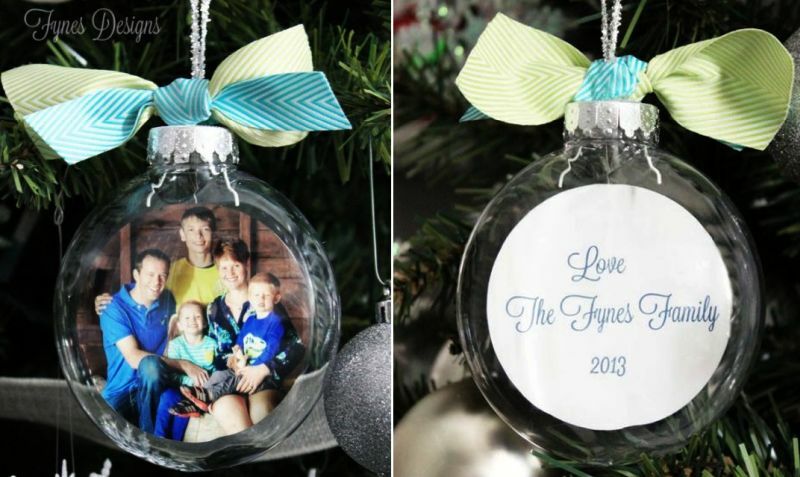 This DIY glass ball photo ornament is just what you need to personalize the Christmas tree. 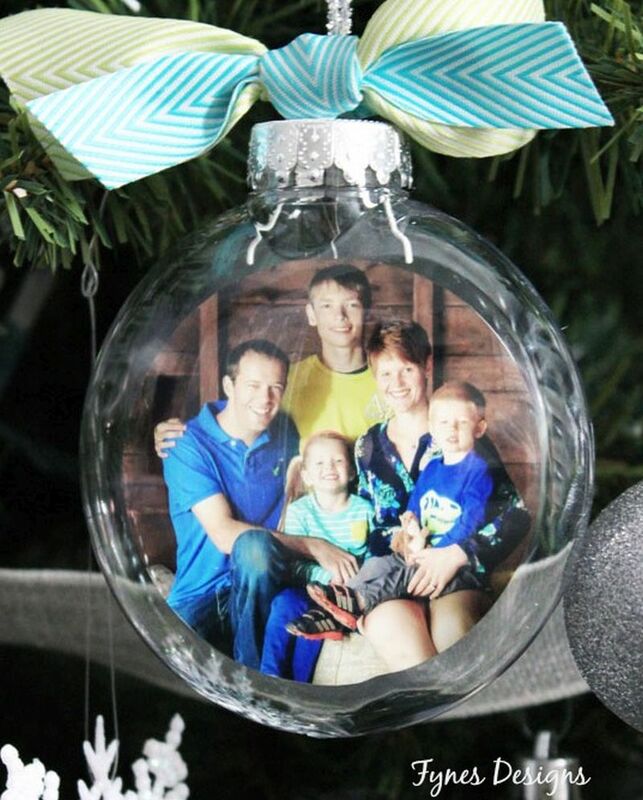 To make this, you need to insert your family or a solo photograph inside an empty glass globe, add some glittery tape, fancy ribbon on the top to make it look extra spunky. 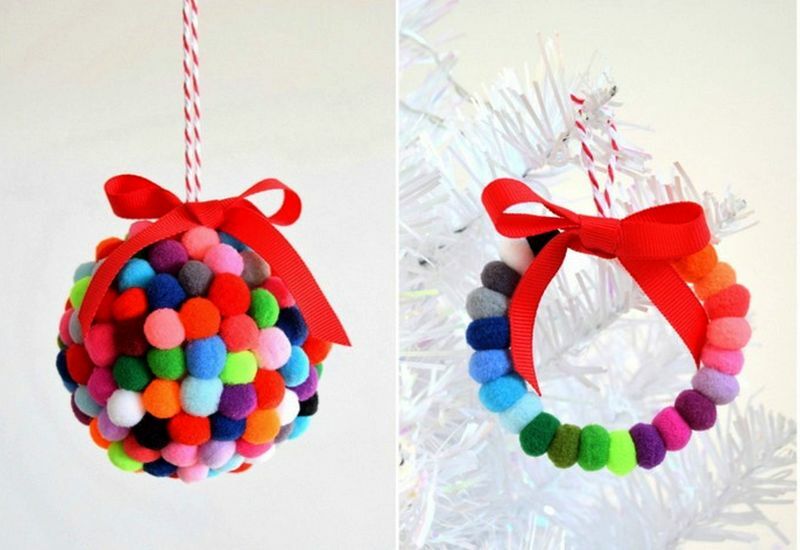 Glue different colored pom poms together to form a ball that stands out as a beautiful ornament with a creative twist. You can also make it look like a small wreath and attach it to the Christmas tree. 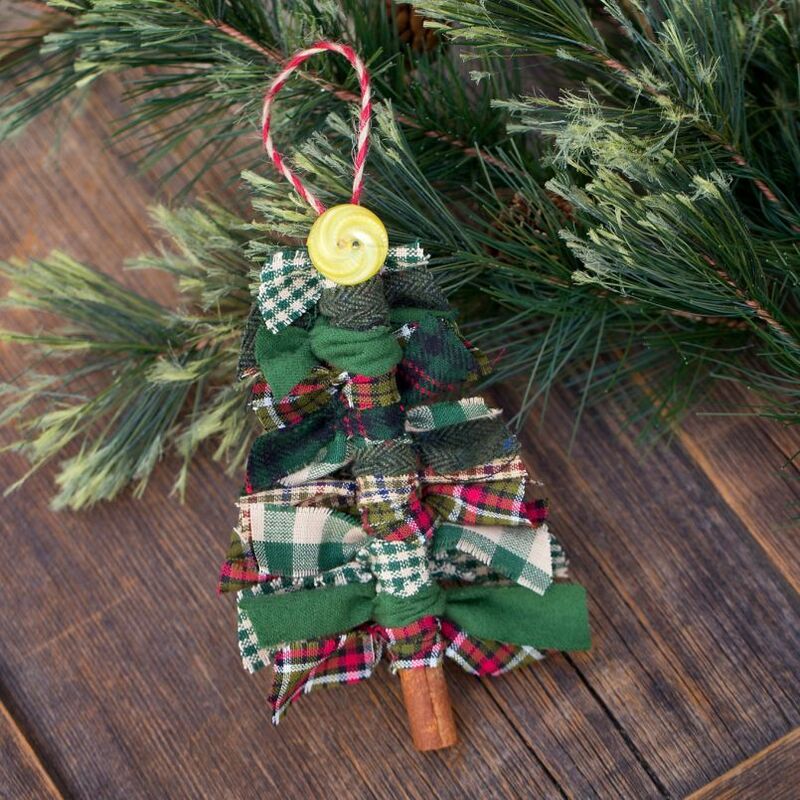 You can easily make primitive Christmas tree ornaments from scrap fabric remnants and cinnamon sticks. Just take a few thin strips of fabric, tie them onto a single cinnamon stick, cut them into the shape of a tree and you are ready to hang them to your tree. Frozen icicles hanging down from a roof create a mesmerizing sight. 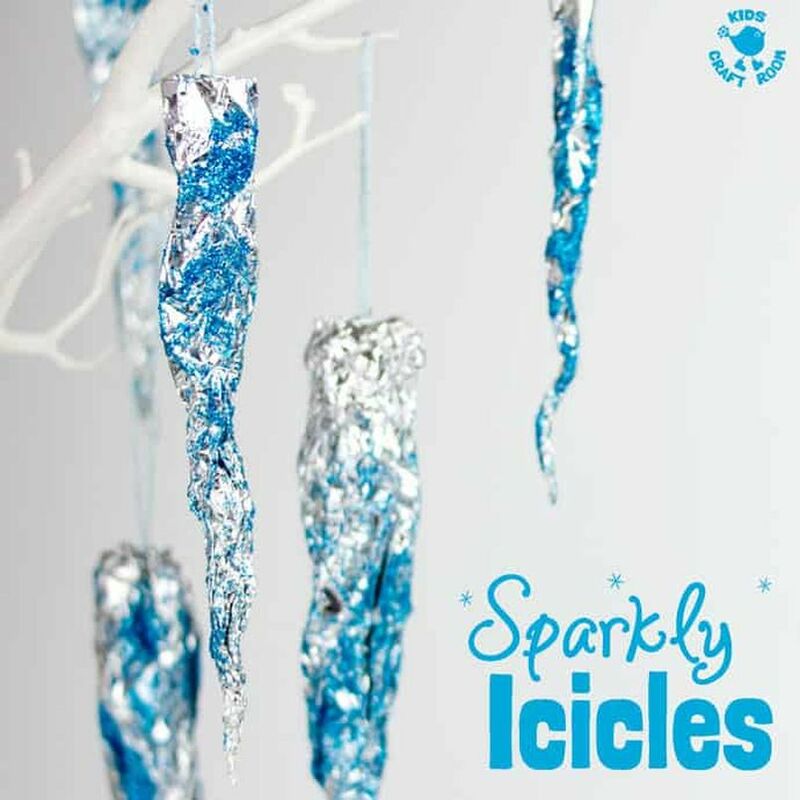 You can also add a similar kind of feel to your Christmas tree with DIY sparkly icicle ornaments. Making one isn’t much difficult: you need to fold an aluminum foil in shape of an icicle, decorate with glitter and hang it using a thread. See the full tutorial at Kids Craft Room. This is a quick and easy Christmas craft that even kids can try. 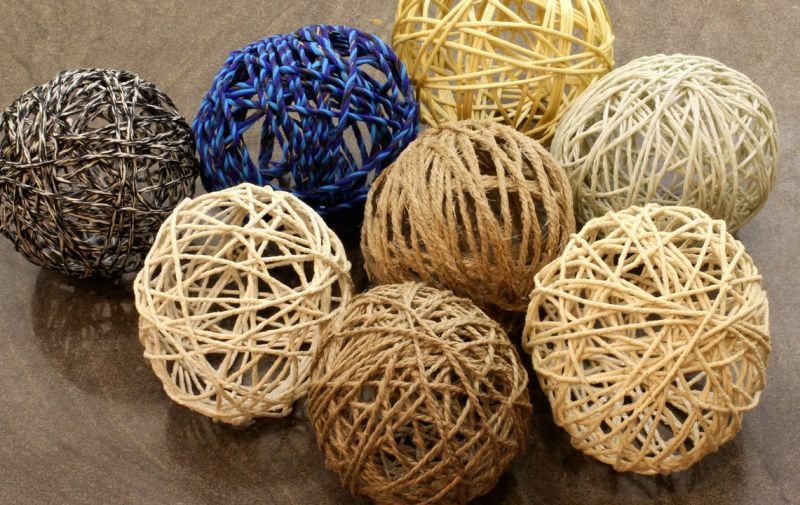 Just wrap a small ball in the center of a square piece of burlap and tie it to look like a head. 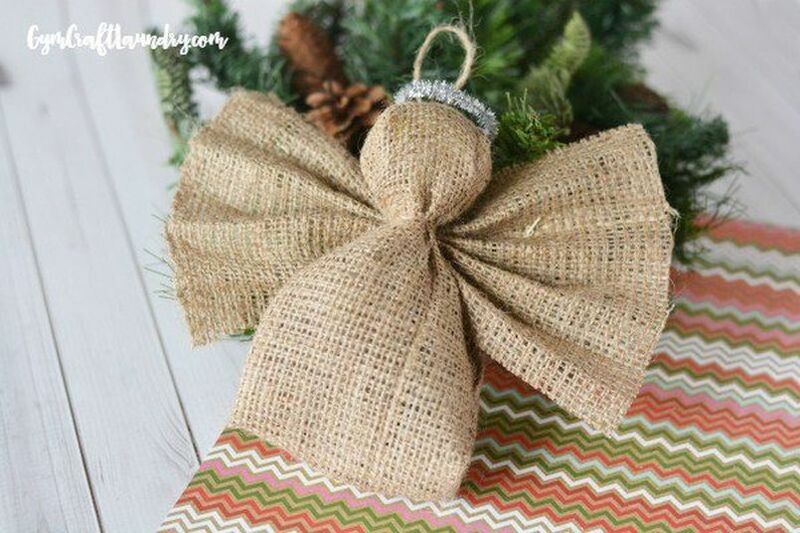 The wings of the burlap angel Christmas tree ornament can be created with another piece of burlap. 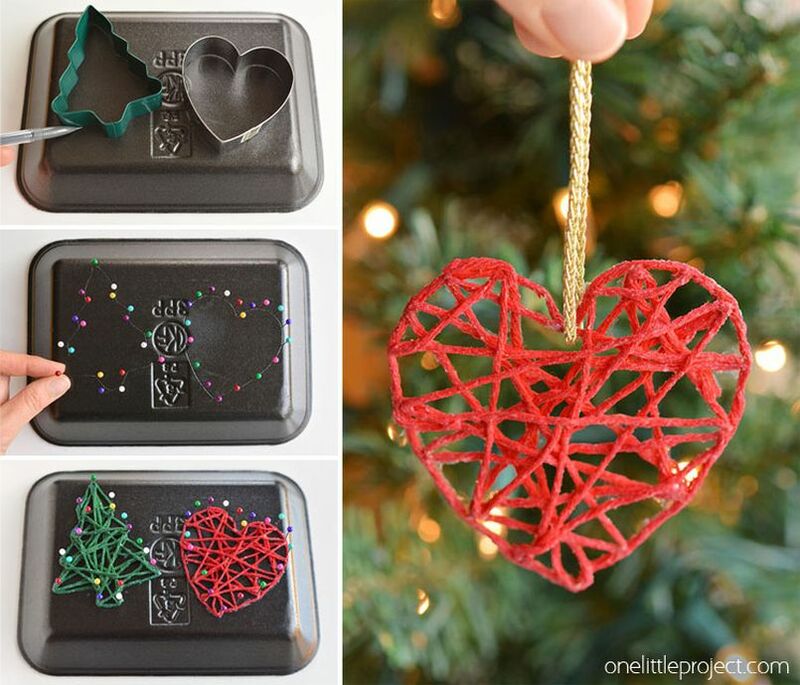 You will need twigs, twine, hot glue, and a garden shear for this Christmas craft. 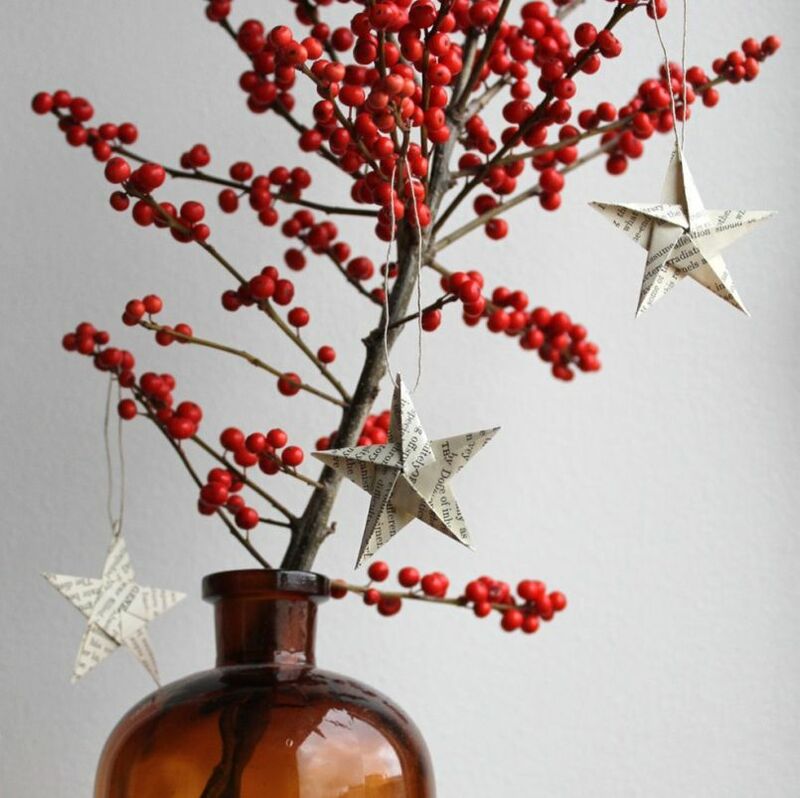 If you are fond of simple decorations, this is probably the right option for you. 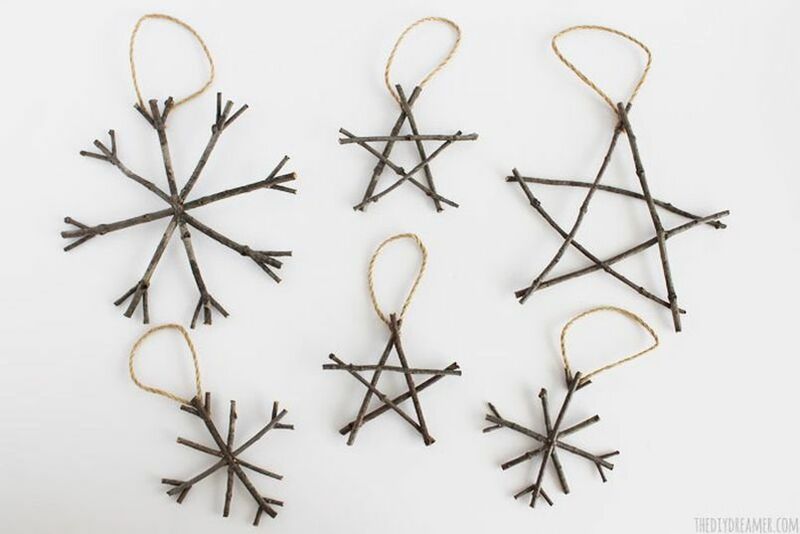 Just tie up thin branches in shape of a star, snowflake, tree or anything you can imagine. These artificial Acorn are created using foam, twine, glitter and a few sewing tools. 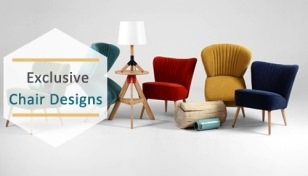 It can be personalized to your taste – you just need to change the color combination. Foam capped inside glittering twine can complete the cup-shaped cupule. See the full tutorial at Crafts n Coffee. 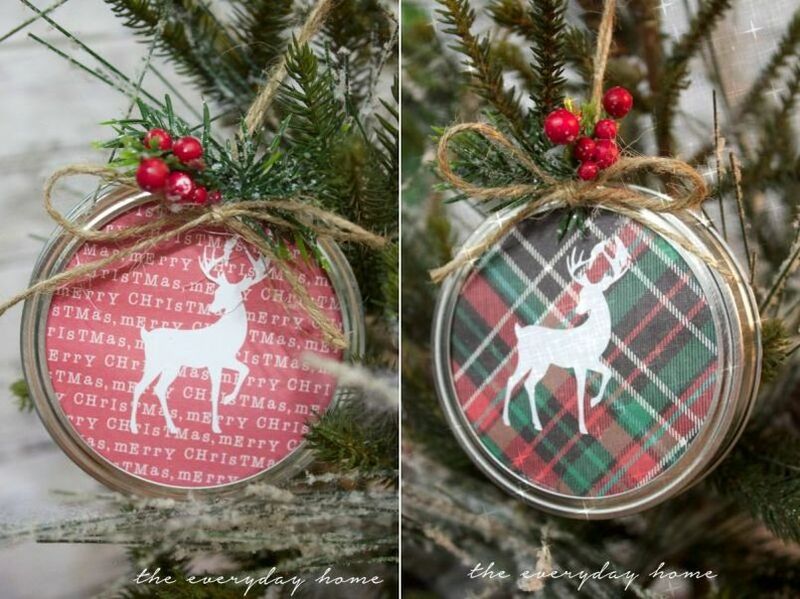 The Everyday Home Blog came up with this interesting DIY mason jar lid Christmas ornament. If you want to try it, you’ll need to glue paper cut outs in the lid and then paste your desired festive stickers, embellish it, and its ready for the Christmas tree. Nature-inspired Christmas decoration can win everyone’s heart. One similar craft is making wood slice ornaments. 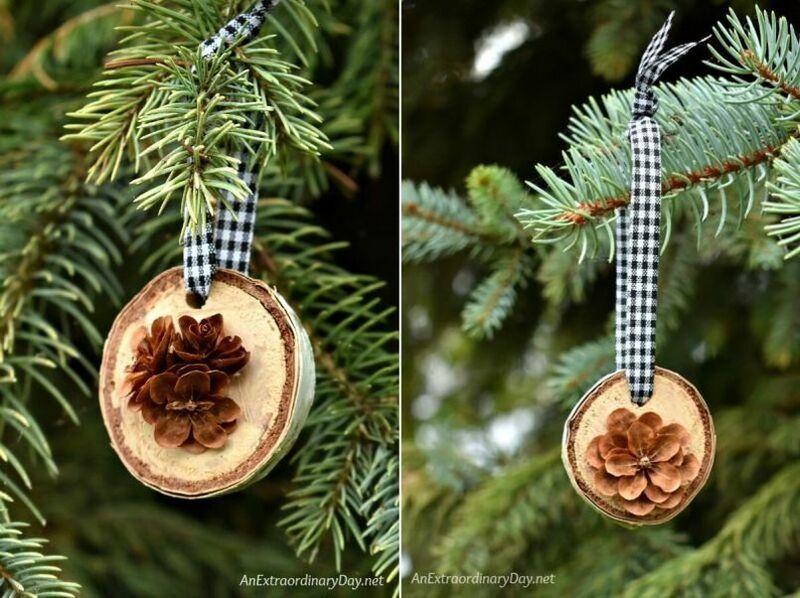 One can simply write, paint or decorate it with different things, but if you’re looking for something unique, make use of pine cones to make one-of-a-kind ornament. Children would love making this cute reindeer ornament. You will need a ribbon, a pair of googly eyes, and red pom-poms for nose. 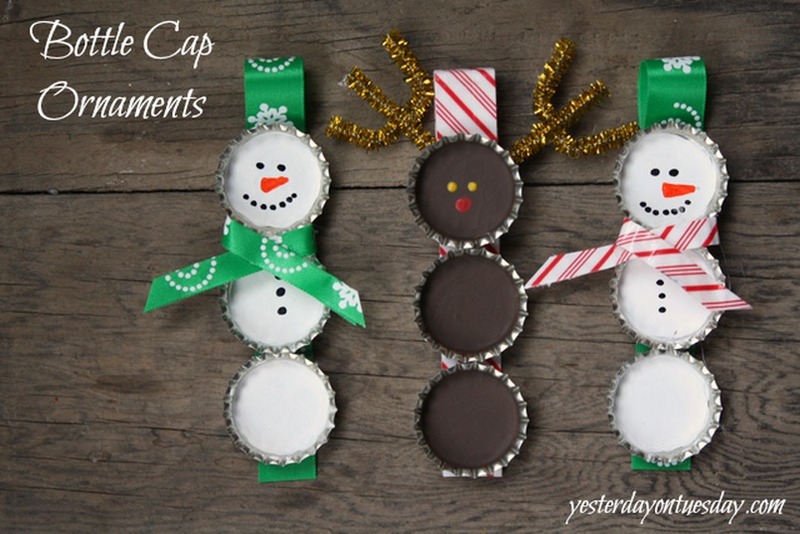 It is a great Christmas craft for preschoolers. You can even join it to create more shapes like hat, sled, etc. 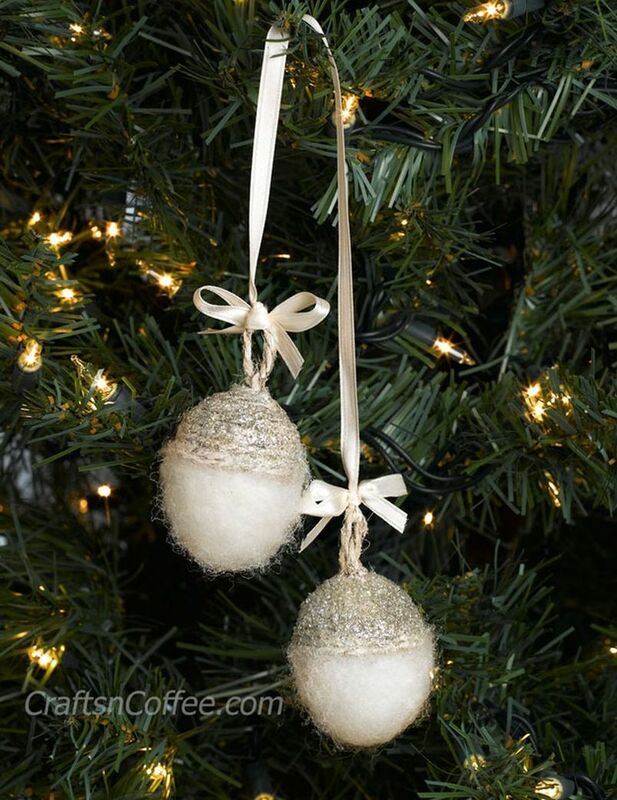 You will need cotton yarn, glue, a Styrofoam plate, sewing pins and cookie cutters to make these wrapped yarn ornaments. Start with marking your design on a Styrofoam plate with metal pins. Attach glue soaked yarn around the outline, shaping your ornament. Let it dry for a few hours, and it’s ready to hang on your Christmas tree. See full tutorial at One Little Project. Don’t have the time and will to pull of a lengthy Christmas craft, make Christmas Tree Baubles from colored/patterned paper in a jiffy. Make paper strips of equal length and join them using a twine in rounded shape. 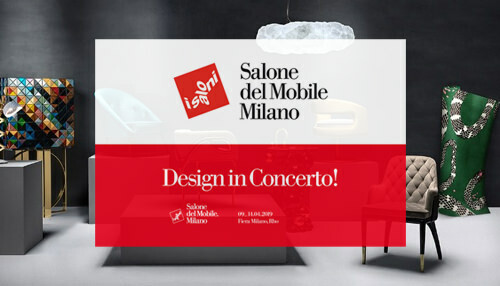 Unfold and enjoy! Origami can come in handy when you’re trying to make some Christmas tree ornaments at home. You can try your hand at folding paper to make stars or other decorative ornaments to attach to the tree. You can read details of how to do at Inspiration Songket Affairs. You think bottle caps are useless, wait! You can easily turn them into a Christmas tree ornament. Just glue up two or three bottle caps on a ribbon. Paint cute faces on the back or front of the cap and you are ready to hang it on your tree. It can also be decorated with colored ribbons and pipe cleaners. These French Macaron Christmas tree ornaments are super easy to make. You will need to paint a handful of caps in your favorite colors and then glue up them in pairs. Don’t forget to include strings to hang them up to your tree. 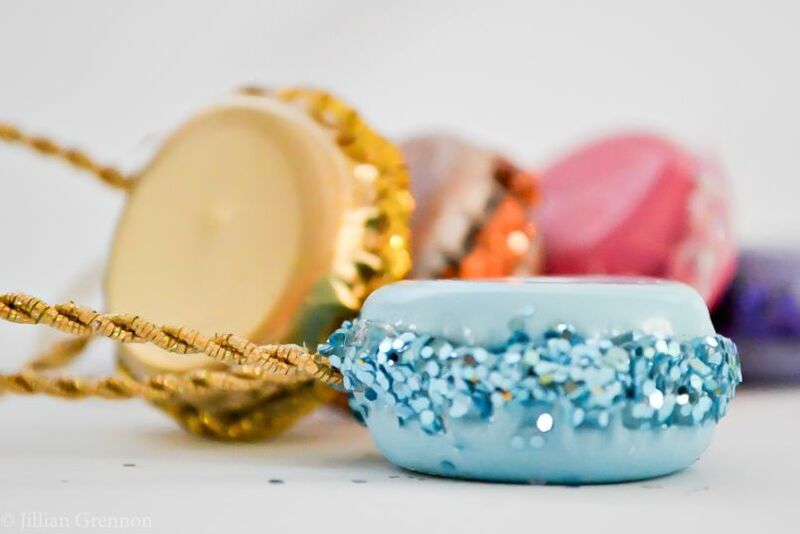 Use hot glue to keep two caps together and apply glitter to add elegance to the ornaments. 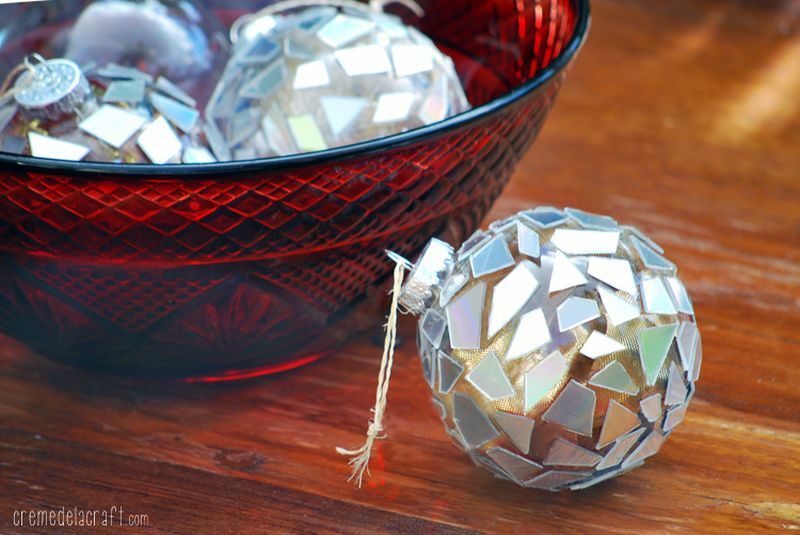 Turn old CDs and DVDs into beautiful, glittery ornaments to hang on your Christmas tree. Just paint them in different colors. The best way is to involve kids, who will willingly enjoy smudging paint on the CDs. 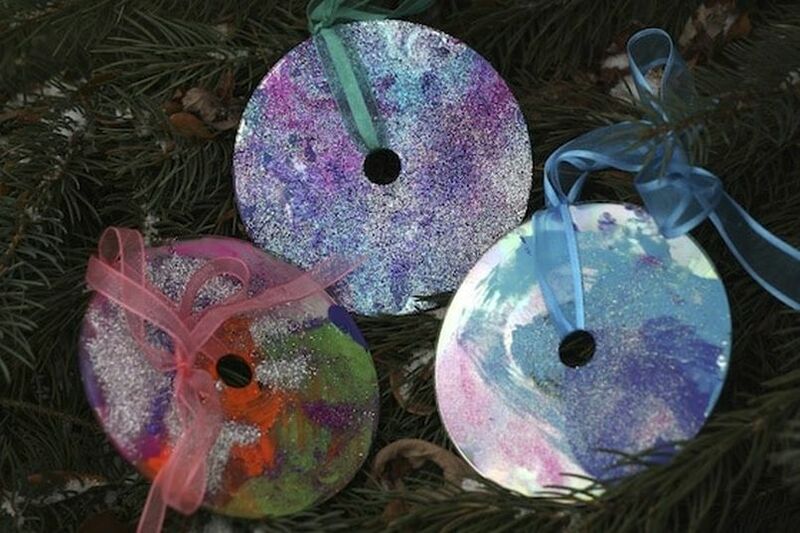 Brush glitter all over the CDs and use a ribbon to hang them to a tree. Pinecones have a huge potential in home decor and DIY projects. Use them all bland or paint them in your favorite colors or glitter, they are sure to add naturalistic charm to your Christmas tree. 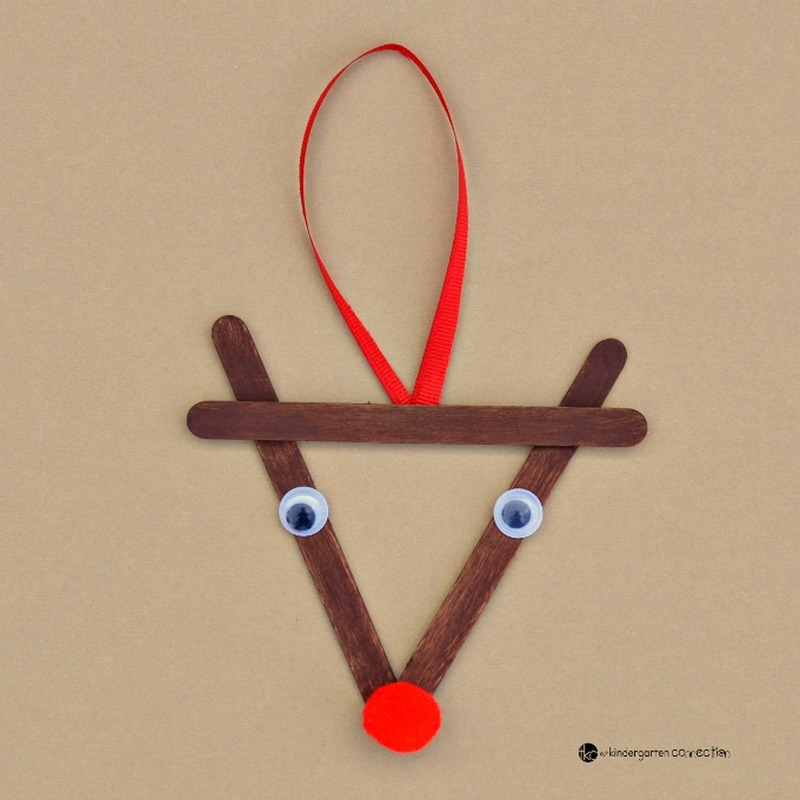 You can even turn them into reindeer using googly eyes, pipe cleaners, glue twine and a few crafting tools. Follow the tutorial at Fireflies and Mud Pies. This button wreath ornament is an easy craft perfect for preschoolers. They will find matching different colors of buttons interesting. Once the buttons are sorted, they can be thread onto a pipe cleaner and then tied on both ends, creating a circular shape similar to a wreath. Decorate it with ribbon and tinsel, attach a string, and hang it on your tree. This rustic walnut shell Christmas tree ornament can be crafted by kids, teens, and adults. The most crucial task in this project is cracking walnut into half pieces, so the most experienced can take up the challenge. 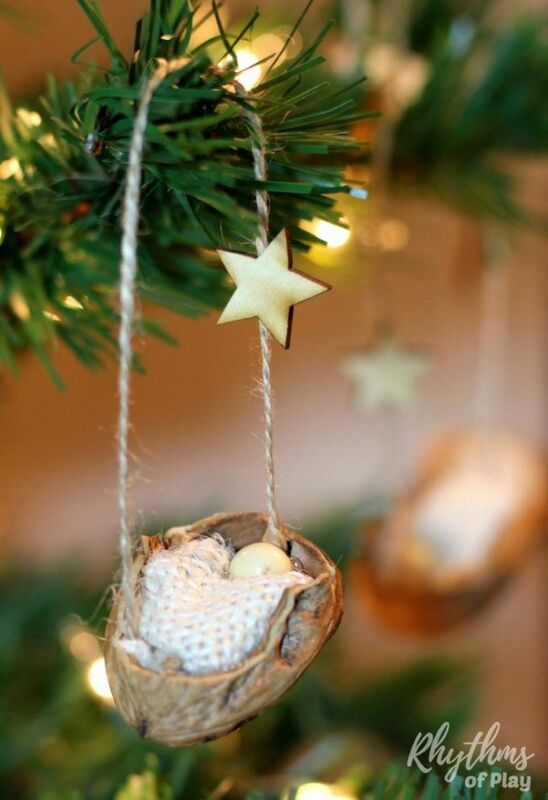 Once you are done cracking the walnuts, decorate them with burlap and wooden beads. Make small holes to attach a twine for hanging it to tree. You’ll need a walnut, crafting felt, white crafting fur, scissors, pen and a few other crafting supplies. Walnut becomes head of the gnome, while craft felt is used to make a conical cap and white crafting fur for the beard. If you wish to make one, see the full tutorial at Etsy Blog. 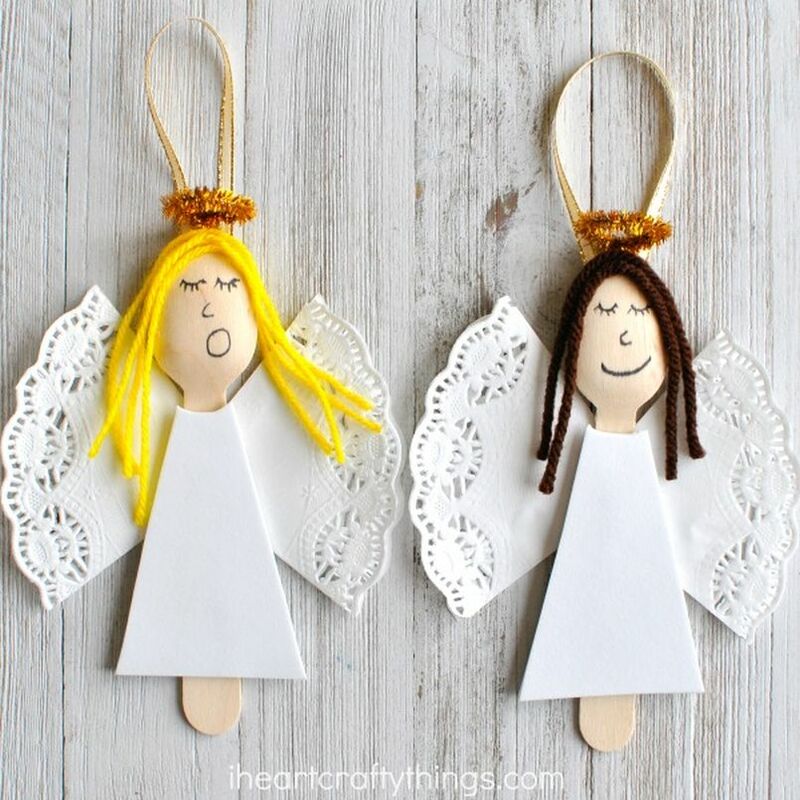 Have a look at angel ornaments made from wooden spoons and craft foam sheet. The back of the spoon serves as the face, while wings are made from paper. See the full tutorial at I Heart Crafty Things. 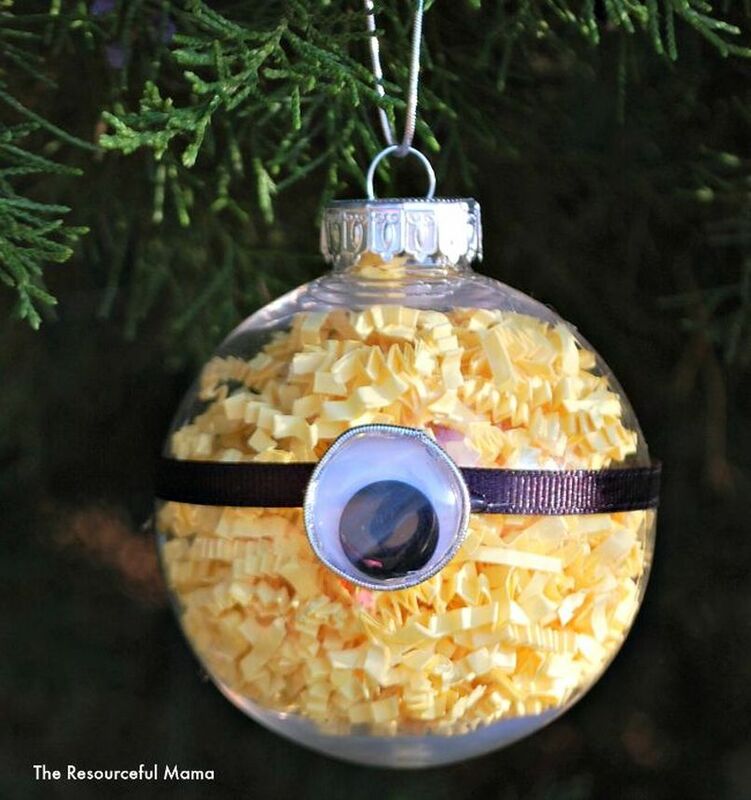 If your kids are crazy for Minions, you should make a Minion ornament to delight them this year. 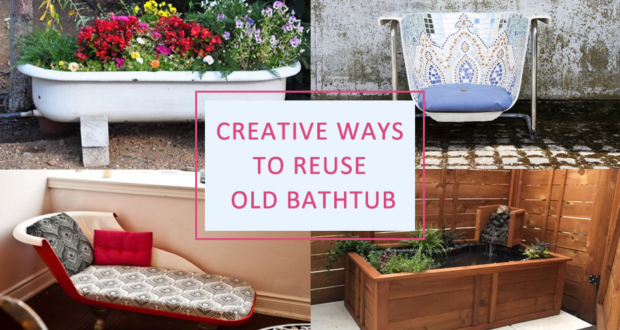 You’ll need yellow decorative shed, wiggly eyes, black ribbon and a ball ornament for this DIY. Just fill the ball ornament with yellow decorative shed. Paste a fake eye on a ribbon and then attach it to center of the ball to remind of the Minions. 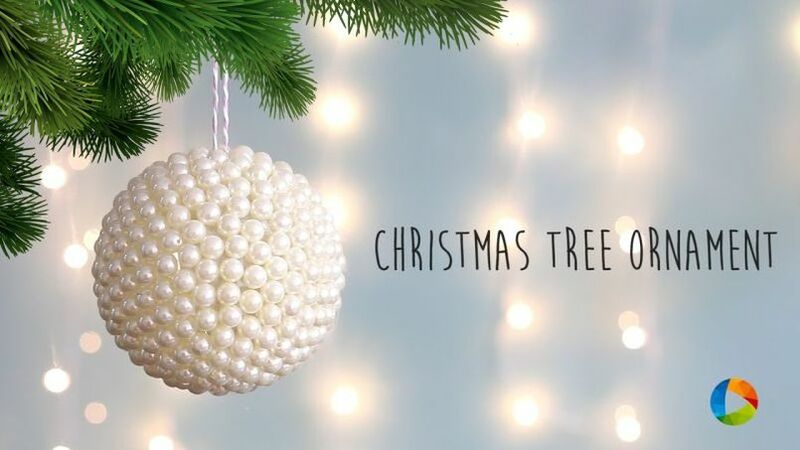 Achieve a cool Christmas tree decor by gluing pearls all around a plastic/glass ball. You can even create patterns of pearls to make it more appealing. You will need lots and lots of pearls for this, so start stocking up your supplies.